CTM Installs New Treasurer – Welcome Joshua Mundell! Besides serving as CTM’s Treasurer, beginning in February 2018, Joshua is attending Concordia University in Irvine, California. Josh’s focus at Concordia is in finance and accounting. He is also the founder and CEO of a startup company called NeighborING, (https://startneighboring.com/) a company focused on helping neighborhoods by connecting those that need chores done with willing and able college students. It’s a win-win situation – helping students, and getting your chores done! 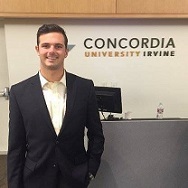 Joshua is also a board member of CTM, and is very focused on spreading the word about CTM to other students and youth at Concordia University, and the Southern California region. He is working with Arthur Magezi and our other board members to launch a “CTM Youth” initiative in 2018, which will serve to help develop and equip for success the youth of the backcountry villages in Uganda. Previous PostCTM Uganda Partners with Nigerian Church in Follow-up to Churches …Next PostA Look Back at What You Helped Us Accomplish in 2017!